Weddings often involve more parties and ceremonies than just the wedding itself. Many weddings have numerous dinners and gatherings leading up to the big day where friends and relatives get together with the happy couple to reminisce, give presents and talk about the couple's future plans. When these occasions take place inside someone's home, decorating is essential to help the event feel special. Decorating the home of the bride's mother for wedding activities is often a joyful activity that multiple family members can take part in together. Clean the house thoroughly to remove any dirt or debris. Temporarily remove any items on the floors or tables that don't need to be there and dust every surface with a rag to eliminate dust that has accumulated. Wash the floors with warm water and mild detergent to have them looking their best when guests or members of the wedding party arrive. The cleaner the house, the better the environment leading up to the wedding. Hang pictures of the bride around the home. The photos should show the bride at various stages of her life, starting with childhood and leading up to her time spent thus far with the groom. This enables the guests to see the progression of the bride's life up until now. Include any engagement photos if the couple had any taken. Create a space for gifts if bridal showers and similar types of events will be happening in the mother's home. Some bridal gifts take up a lot of space, so having an area ready for them helps to keep the house organized so it looks better and nothing gets lost. Place flowers around the home. Find out if the wedding will utilize a particular flower arrangement and then follow that same theme for the mother's home. If the wedding will not have flowers, pick types that either the bride or the mother enjoy. White flowers help keep with the theme of the wedding since most wedding gowns are white. Place enough tables and chairs for everyone to sit down. If there aren't enough tables and chairs in the home, rent extras and cover them with decorative paper or tablecloths to help them fit in with the wedding style. Use cloth napkins and napkin holders to further decorate each table. 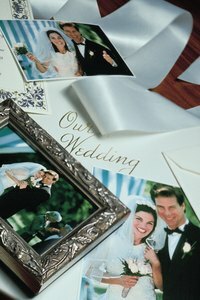 Place a different picture of the bride and groom together on each table to celebrate the happy couple. Hang white lights around the house. While normally used around the holiday season, strings of white lights are appropriate for weddings and wedding parties as well. Keep the power cords as hidden as possible so the house looks better and so no one trips over them. Light rooms with candles in jars during any functions or special occasions in the mother's house. The jars help prevent the candles from falling over and the candles provide both a romantic visual and a pleasant scent when burned. Stick with white and red candles to keep with the themes of weddings and love. The Knot; Wedding Receptions: 17 Ways to Spruce Up Your Site; Nicolle Sellers, et al.